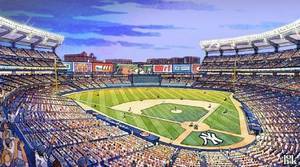 How about the [new] New York Yankees home stadium, in 2009 set to replace the 1920’s “House that Babe Ruth Built,” in the Bronx near Manhattan Island. The billion-dollar-plus facility is being financed in part by $220 million of New York City government funds…tax free bonds or other benefits or future revenues waived away by the decision-makers at City Hall. In these times of discussion about financial rescues and sector bailouts et al, with rising public comment about the appropriateness of using public sector, taxpayer dollars for private sector beneficiaries, the practice of municipalities and states allocating hundreds of millions’ of dollars for private sports facilities is become part of the debate. The headlines in New York newspapers told of the Yankees going on a spending spree and showering just three ballplayers signing contracts with almost a half-billion dollars (in future paychecks). Three players – there are nine on the field; what does this say about the state of at least New York sports? We watch the obviously wealthy New York Yankees organization, which is putting up $1.1 billion of its own funding, getting $220 million from New York City government — that’s $75 million for parking facilities, $135 million for nearby waterfront parkland, and a few other millions of odds and ends. It could have been more. One of the stars in the political “conservative” movement firmament, former mayor Rudy Giuliani, was set to give the Yankees at least $800 million of taxpayer monies. The former mayor, an unsuccessful candidate for the presidency, was set to issue $1.6 billion in bonding to build the new stadium. Successor Michael Bloomberg, an admired finance and business leader before being elected mayor, has been much more conservative and cut the funding dramatically. Does government belong in the sports business today? What do you think of such involvement as municipal and state finances continue to deteriorate? Are these “fields of schemes,” as one author asked – assembling public money and benefits destined for making private profit? In addition to taxpayer dollars, there’s another important “free market” aspect of funding for major league ball teams (at least in New York). Hey fans, here’s what the Yankees are offering you for the new season: you can buy tickets for the Chicago Cubs – Yankees exhibition game for (priced from) $40 to $13,350. No, that’s not a typo. That’s for Friday – the Saturday game ranges up to $14,118. The Season Package including all regular season home games runs up to $68,000. Want a bargain? Look at the game with the Cleveland Indians on April 17th – topping out at only $9999. How will fans afford this? The average fan…well, let’s just see. The large corporations lining up contracts for luxury boxes? This about tax deductible business expenses, you betcha. Although, Associated Press has reported that selling suites may not be a sweet business for the New York Yankees in these tough economic times. There were 51 suites priced from $600,000 to $850,000; 44 have been committed by contract. Still, the team isn’t hurting; almost all of the premium seats are gone (cost: $500 to $2500 per seat per game near home plate). The Yankees’ owners are so confident that if you build it they will come – and pay – that they’ve opened their treasury for just three new ball players — Mark Teixeira signed a $180 million deal; C.C. Sabathia will get $161 million; and A.J. Burnett, $82 million. In the last few days the team’s spending spree totaled $400 million plus. Great argument, it would seem, for the major league interests (especially those in smaller cities) to come together and agree on salary caps before they lose the common fan (and hers or his ticket dollars). And a good time as well for the Great Fathers and Mothers of Government to consider what they are investing in these days. I’m all for people earning all they can, based and ability and merit, and all for sports and especially the great American pastime, baseball. But, hey folks in leadership positions, can we get these things in proportion to life’s real needs? Seems a bit unsightly – poor optics, we could say in business terms – for peoplewho can spending all that they can…while so many Americans are losing jobs, experiencing downsizing, losing their homes to foreclosure (10,000 foreclosures per day now), watching their 401-k’s become 201-k’s, and worse. And a footnote from the financial scandaldu jour: Jeff Wilpon, COO of the New York Mets team, also building a new stadium with $600 million in team money and $90 million in New York City public financing, and $75 million in rent credits from New York State — assures the media that the losses of money entrusted to Bernard Madoff will not affect the team’s finances. His father’s business (Sterling Equities) lost a reported $300 million in the Madoff Scheme of Things. But not to worry, this won’t affect the team’s treasury. 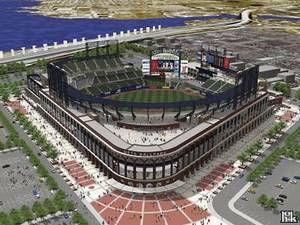 New York City is allocating $85 million in FY 2006 capital budget funds and $4.78 million in capital reserve for the new Mets ballpark. A report by the Independent Budget Office says that the ballpark will cost the city taxpayers $177 million over 40 years and the state taxpayers $89 million. The use of tax-exempt bonds will save $300 million for the team. Citigroup is paying the Mets organization $400 million over 20 years for the naming rights to the stadium. (Wags on the City Council said the new name should be “Citi/Taxpayer Stadium.”) At the time it seemed like a stroke of genius in financial services and bank marketing. In the current financial crisis, with 20/20 hindsight, there are some critics questioning the marketing investment. But this is a long-term proposition for Citigroup, and a competitive marketing strategy. Let’s hope no expensive signs have to be changed. Enron Field became Minute Maid Park in Houston. You know why. Bank One Ballpark became Chase Field in Arizona (when JPMorgan Chase absorbed Bank One). Given the shifting sands of business, hey, you never know! Luckily, the ball teams are not as worried as some corporate leaders today.